Posting Funk…and not the good kind. I have really fallen behind on posting. We have been busy but every time I start to write I go completely, blank so I will do what I do best: ramble. The house is starting to come together and yesterday I finally got to hanging things on the wall. I dearly love this house but it is “builder vanilla” right now. The walls, carpets and fixtures are all off-white or neutral and I am not up to painting 10 ft.
ceilings yet. I want to paint the walls and ceilings the same color but Tony is not sold on it yet. Maybe he’s right. I bet that would make a mess! Matthew and I did manage to plant some flowers in the front of the house. It looks better, at least like some one lives here. The previous owners let everything the builder landscapped die, even the two trees in the front yard. It looks strange that every house in the subdivision has two trees out in the yard but not ours. Makes us look like tree haters instead of tree huggers! I do not know what kind of tree to plant. I just want something that I do not have to constantly pick up after. Tony is killin’ em at his new job. He has the ability to make things run so much more efficiently that I think he has improved some people’s quality of life. He is happy and he is awesome. I am so proud of him. I hope to get back to being productive myself some day. Maybe if things go well I can get back to school in the fall! Here’s hoping! I have been reading my friend Dee’s blog a lot lately. She is a talented writer and and interesting person and I love how she tells a story, too. There is a link to her site on ours. I suggest you stop by and read sometime. It always brightens my day! Matthew is growing by leaps and bounds lately, physically and mentally. He is only two feet shorter than me now (I’m 5′ 8″) and he has been blowing Tony and I away a lot these days because he is reading words on his own. He has been able to memorize word spellings for a while now but he is now reading and sounding out words on his own that he has not been exposed to. He looks over Tony’s shoulder while he is on the laptop and tells Tony words he sees on the screen! Mommy and Daddy are impressed! He also has shown to be a very good kid when it comes to interacting with other children. He can be very gentle with younger kids and probably waaayy more patient with difficult kids than I can be. He must get that trait from his Daddy. It will serve him well in life. On a somber note, I was heart broken to hear that the body of the eight year old girl from Tracy, CA was found in a suitcase in the middle of now where. That poor family. I saw the mother on the news today and she could not even talk she was so racked with grief. I can’t imagine some evil person taking my child. I have no idea how any one could do such a thing but it seems to be happening more and more now a days. Infuriating, heartbreaking, so utterly wrong that the most evil acts are committed against the most innocent of our society. The family has my prayers. Guess my mind was not as blank as I thought it was. I just had to post this picture of Matthew. It makes me smile every time I see it. He didn’t want to wake up and the sun light was bright through the window. 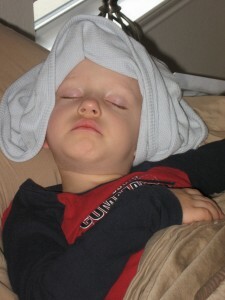 He put the blanket over his head and I had to pull it up. I know he is four be I am still afraid that he will suffocate! I can totally relate to going blank. There are days when I think I just CAN’T possibly think of anything to write. I’ve started keeping a paper notebook. Some of what is in it will never make the blog. I decided I needed a place to be a little more honest even it when it isn’t very flattering to myself. I figure if I just write every day that either I will get better or I will realize it isn’t for me. I absolutely love the picture of Matthew and the blanket. Kids can be so funny when they sleep. You just want to smush those little cheeks together! He is precious and of course he is smart – he has smart parents!